The seeds of what would become Assumption Church were planted across Buffalo in the late 1870s. As Poles settled in and around the Black Rock neighborhood they needed a church to meet their religious needs. Since St. Stanislaus Church on Peckham Street was too far away, they began attending German parishes of St. Louis, St. Michael, and St. Francis Xavier. As their community grew, 30 Polish families met at St. Francis and appealed to the bishop to give them their own church in the North Side. With such a large Polish population, the bishop granted the request and Father Theophil Kozlowski was put in charge of forming the new parish. In short order, land was purchased and on September 8, 1888, the cornerstone was laid, marking the birth of Assumption Parish. In November the parish was incorporated and in January of 1889, Bishop Ryan dedicated the two-story, red brick, combination church and school building. Like the rest of Buffalo, Assumption expanded through the end of the nineteenth century. By 1903, it was clear to Father Louis Chodacki that a larger, more impressive church would be needed for his congregation. 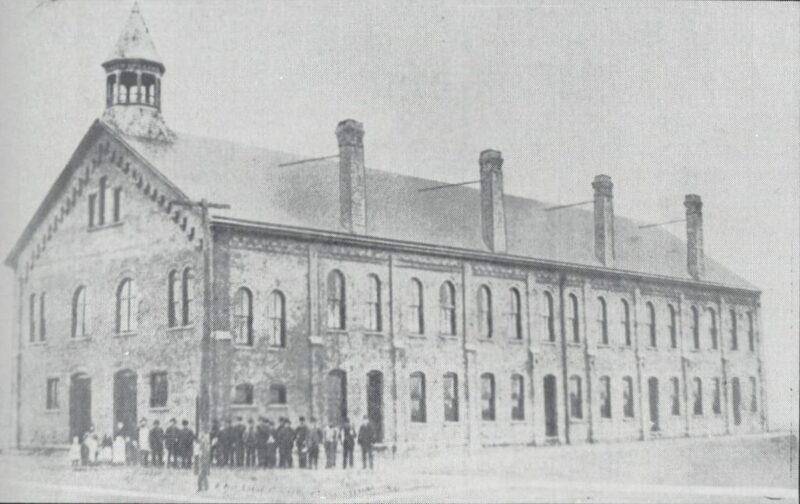 In preparation for the larger building, Father Chodacki purchased a lot on the corner of Amherst and Germain and starting in 1908 the groundwork for the building was being laid. Carl Schmill was hired to design the church, the foundation was dug, walls were put up and the building was roofed, but progress was slow due to the priest’s health. When the parish reached over 9,000 souls, Father Chodacki knew he couldn’t care for them all and resigned. He was replaced by Father Ladislaus Hordych who quickly caught up on the construction and on August 16th the cornerstone of the new church was formally placed. With a new church building the parish continued to thrive. 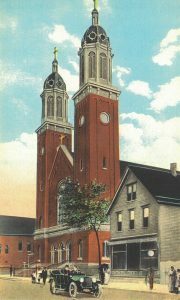 By 1917, the growing Polonia around Hertel Avenue was enough to justify its own parish and St. Florian’s was established out of Assumption’s territory. The loss of the area didn’t slow the church down; in 1924 a new Assumption school, later known as Our Lady of Black Rock, was built. The stability of Assumption and all of Buffalo took a hit with the Great Depression and World War II. It would take almost 10 years and a vigorous pastor to get Assumption back into shape. In 1961, Monsignor Maximillian T. Bogacki was put in charge of the struggling Assumption parish. Under his leadership a $750,000 campaign was undertaken to revitalize the church. His plans included cleaning and painting of the church’s exterior, adding air conditioning to the parish hall and having the church interior redecorated. For the internal art, Bogacki hired Polish sgraffito artists Michael Baranowski and Joseph Slawinski to craft the life of Mary in five panels with seven accompanying Christian symbols. Monsignor Max also established a number of new parish organizations. One of the momentous events in Assumption’s history occurred September 17, 1969 when Cardinal Karol Wojtyla, future Pope and Saint, visited the church. Part of a tour of Polish America, a small ceremony was held with prayers and hymns that concluded with Wojtyla giving a speech from the church pulpit. Like much of the city, Black Rock and Assumption suffered from the suburban flight of the 1970s, ‘80s and ‘90s. The church and school stabilized under the leadership of Assumption native, Father Richard Jedrzejewski. Jedrzejewski helped oversee the integration of the St. Francis Xavier, St. John the Baptist, and St. Elizabeth churches into the parish, instituted the International Harvest Festival, and celebrated Mass with over 1,000 congregants when the Buffalo Mass Mob visited in 2014. "Buffalo’s ‘Mass Mobs’ Filling Pews Here and Elsewhere - The Buffalo News." Www.buffaloNews.com. Buffalo News, n.d. Web. 18 Dec. 2015. Centennial Book: 1888-1988: Assumption of the Blessed Virgin Mary Parish: Buffalo, New York. Buffalo, NY: n.p., 1988. Print. Złoty Jubileusz Parafii Wniebowzięcia N.M. Panny W Buffalo, N.Y.: Dnia 6-go Listopada 1938 R. Buffalo, NY: Druk "Dziennika", 1938. Print.